Annoying Neighbor Revenge CD | OhGizmo! In the building where I live they’re currently doing some major renovations to the parkage garage in the basement which means all day long they have jackhammers running which despite their assurances are actually quite annoying. Sadly there’s not much I can do about the problem except wait it out but if the disturbances had been caused by my neighbors I would not have hesitated to use something like this. The annoying neighbor revenge CD is a pretty simple idea. If you’re tired of the all night parties, fighting or rock band rehearsals simply point a pair of speakers in the direction of your neighbor’s apartment and put this CD on as loud as you can. It has 20 unique tracks of particular annoying sound effects including drilling, a 200 person party, a child playing drums, walking with high heels, a domestic squabble, doors banging and even spring house cleaning. There are a few other tracks that are a bit less likely to be coming from an apartment including a train, a bowling alley and a baseball game but they’re still annoying nonetheless. Of course the CD also comes with a pair of earplugs to help you preserve your own sanity. 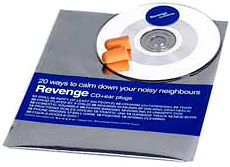 The Annoying Neighbor Revenge CD is available from Crazy About Gadgets for about $20. It’s a great idea though, and it has been quite a while since it was last mentioned, so I imagine there are many new readers who haven’t seen it yet.